With Fall in full swing and Winter approaching people are curious about what Mother nature has in store. If the Doppler radar bores you or if you enjoy a bit of folklore, there are other ways to predict the weather. Persimmon trees grow throughout Texas and the U.S. Persimmons are small fruit trees that rarely grow as high as 40 feet. The dark wood of the tree and edible fruit have been used for centuries. The trees are very hardy and will grow in almost any climate, from sub-tropical to very cold. Folklore reveals that superstitions about cutting persimmon trees may help cure warts, cancer and even predict weather, even Texas weather. According to old-timers, persimmon seeds can be used to predict the severity of upcoming winter weather. A persimmon seed when cut in two pieces, split along its natural seam, will display one of three symbols; a knife, a spoon, or a fork. If a knife shape is revealed within the seed the approaching winter is believed to be cold and icy. The anticipated cold wintry weather is believed to �cut through you like a knife,� as some might say. 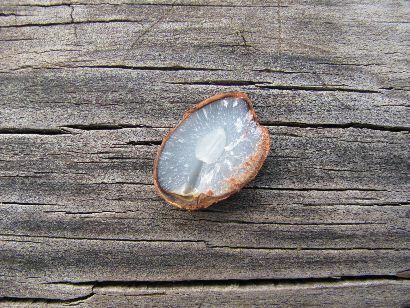 If a split persimmon seed reveals a spoon the area is believed to be expecting wet conditions, snow, and lots of it. The spoon is suggestive of a shovel that can be used to dig out of the snow. If a persimmon seed reveals a fork the legend indicates the approaching Winter will be mild, and could perhaps be accompanied by a light feathery snow. 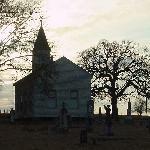 The 2010 Farmer�s Almanac gave its persimmon report from N.C. in late September. The N.C. seed reveled a spoon. 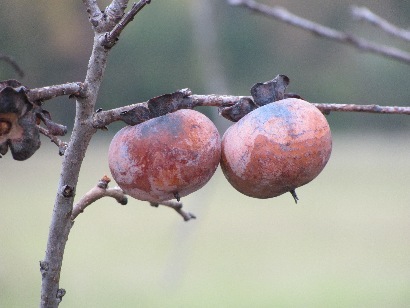 Elana Goolsby has a large persimmon tree in her pasture. She does not harvest the fruit, nor does she pay it much mind. She commonly forget the tree is there until someone who passes by about sunrise in the late fall calls to inform her that a large buck is feeding on the persimmons. 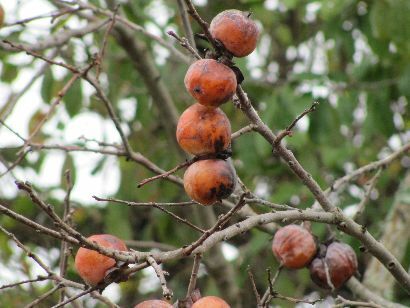 The Messenger harvested multiple persimmons from Goolsby�s tree in order to take a peak at what winter weather may be in store. It is said that the seed outcome varies depending on the region from which the fruit is harvested. Five seeds were split and observed. Each seed revealed a spoon. According to legendary folklore and Goolsby�s persimmon seeds East Texas can anticipate more of the flaky white stuff, and we aren�t talking about dandruff. Persimmon fruit was once a much sought after delicacy used for breads and puddings by our nation�s forefathers and Native American Indians. Now persimmons are more of a curiosity and a nuisance. The ability of this seed to predict winter weather is one way to for us to reconnect to the foods of our past. �Weatherlore,� like that of folklore, has been handed down from one generation to another. �Lore� predictions for winter weather seem as popular today as they were years ago. Other �Weatherlore� suggest winter will be colder if heavy crops of berries are found on holly and dogwood trees, rolling thunder is heard echoing in the late fall, trees shed their leaves before their color change is complete, and if chimney smoke flows toward the ground. Still others derive their prediction from the forest animals of East Texas. It is said that if squirrels build their nests low and gather food early, ants build their mounds abnormally high, or if birds are seen migrating early or huddling on the ground one should anticipate a harsh winter. Some also believe that if a turkey breast bone, cooked in the fall, turns purple or dark blue the winter will be more severe than usual. Wintry folklore weather predictions vary, but it appears the most popular, regardless of where people live in the U.S., revolves around the Banded Woolly Worm. Often called a woolly bear or fuzzy bear, the woolly bear caterpillar, which is the larval stage of an Isabella Tiger Moth, is supposed to forecast a mild winter if its middle band of reddish brown is wider than the two end bands of black, and a hard winter if it is narrower. Weather information is provided by the National Weather Service, Regional Weather Centers, and Local News Stations. Citizens are fortunate to have these sources for weather information, and should rely on the accurate and timely information these sources provide. Nevertheless, folks have been making weather predictions long before weather specialists and the sophisticated equipment they utilize came into play. Years ago, and for many years, people relied on signs from nature to guide them and predict upcoming weather.